If you are looking for a used Jeep Grand Cherokee in Windsor, Chatham and surrounding area, the AutoMAXX sales team will be able to satisfy your needs. 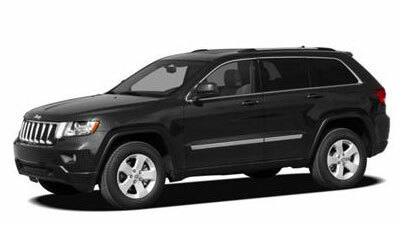 AutoMAXX always has a great selection of pre-owned Jeep Grand Cherokee in stock and add to the vehicle inventory daily. At AutoMAXX we proudly sell and service used Jeep Grand Cherokee to customers from Windsor, Chatham, Essex, Tecumseh, Tilbury, Leamington, Lakeshore, Merlin, Kingsville and LaSalle. The Jeep Grand Cherokee retains Jeep's legendary off-road prowess while providing many luxurious and technical amenities. The Grand Cherokee is available in two-wheel and four-wheel drive configuration with four trims levels: Laredo, Limited, Overland, and SRT8 (four-wheel drive only). All trims (except the SRT8) are powered by a 290-hp 3.6-liter V6 paired with a five-speed automatic transmission. The V6 can be upgraded to a 360-hp 5.7-liter V8 Hemi engine matched to a six-speed automatic transmission. The SRT8 trim features an exclusive 465-hp 6.4-liter V8 Hemi engine and a five-speed automatic transmission, with steering wheel mounted paddle shifters. Both V8 engines feature a Multi-Displacement System (MDS), which seamlessly deactivates four of the eight cylinders depending on engine operating conditions. Adaptive cruise control, dual-pane panoramic sunroof, heated and ventilated leather seats, heated steering wheel, power liftgate, rear seat DVD entertainment system, rear parking camera, a multimedia infotainment system with 30-gigabyte hard drive navigation system, and UConnect wireless connectivity are available. The optional (standard on the Overland) QuadraLift air suspension features full time four corner load leveling and improved off-road performance by increasing ground clearance. Standard safety features include front six airbags, electronic stability control, active font head restraints, brake assist, and tire pressure monitoring. For 2012, a new SRT8 trim has been added, featuring a 392 cubic-inch V8 engine, unique front and rear fascias, 20-inch forged aluminum wheels, Brembo brakes, and real carbon fiber interior accents. Also a new six-speed automatic replaces the previous five-speed automatic when paired with the 5.7-litre V8 engine. Source Chrome Data. The 2011 Grand Cherokee has a great new chassis, engine, suspension, styling and interior. Like the Dodge Viper that brought Chrysler back from the brink of bankruptcy nearly two decades ago, this Grand Cherokee has the potential to do the same. It's that good. Chrysler is not blowing smoke when it says that craftsmanship has returned. NewCarTestDrive.com correspondent Sam Moses filed this report after his test drive of the Grand Cherokee in San Francisco. Source Chrome Data. The suspension dampens imperfections in the road well, and the rack and pinion steering provides a solid and responsive road feel. -- Edmunds.com. Source Chrome Data.